If there’s one indisputable fact in the fashion and beauty world, it’s that the Kardashians are top dog when it comes to celebrity influence. You may love them, you may hate them, but you’ve heard of them, and you can’t deny they’ve worked the media like a charm. Kyle in particular, despite being the youngest member of the family, has been striding ahead of her famous sisters in leaps and bounds in the last few years. It seems near impossible to find a celebrity magazine cover her name isn’t featured on. Kylie Jenner is the name on everyone’s lips – lips being part of the conversation. Kylie’s trademark pout is something that has taken the beauty world by storm, how much of her look is actually down to makeup as opposed to achieved with plastic surgery however is besides the point. The initial release of the ‘Lip Kit by Kylie’ at the end of last November had everyone desperate to get their hands on one. 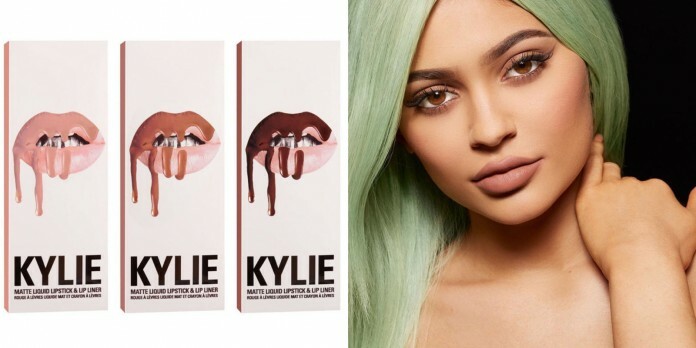 The products, in the three original colours of Dolce K, Candy K and True Brown K, were sold out in a matter of minutes, and hit astronomical resale values when later listed on eBay. Now, with frequent restocks, it’s unlikely you’ll have to break the bank if you want to get your hands on one, but it still can be tricky as the hype has far from died down. In fact, now with a total of 14 shades in variations of matte, gloss and ‘metals’, demand is as high as ever. The $29 for the matte lipsticks (around £20) isn’t too far from unreasonable considering the celebrity name attached, however it probably sounds pretty ridiculous to someone who isn’t used to, or at least aware of, the price tags on high-end makeup. The Metals range is slightly cheaper listed at $18, and the gloss comes in at $15. Costing you more than a tenner is still not completely purse friendly, but I’m sure your bank account won’t hate you too much. As always, makeup dupes are always an option for those more bothered about the product rather than the brand. The Maybelline Superstay 24hr liquid lipstick is a personal favourite, and comes in at a fraction of the price. Perfect for a night out, it dries instantly and won’t rub off on the rim of your glass causing you to need to reapply throughout the night every time you’ve had a drink. Other options include the NYX Soft Matte Lip Cream range, or even Anastasia Beverly Hills liquid lipsticks if you prefer the more upscale end of the High Street’s offerings. So what’s next for Kylie Cosmetics? Kylie took to Twitter calling for fans to vote in a poll on what they’d love to see next, and with options including an eye shadow palette and bronzer, it was the prospect of an eyebrow kit that got fans the most excited. It seems a whole new line of Kylie makeup is on the horizon, a new competitor for high-end brands such as Mac and Urban Decay perhaps? Whatever does happen, considering Kylie’s hold over social media I’m sure we’ll all know the second it does.